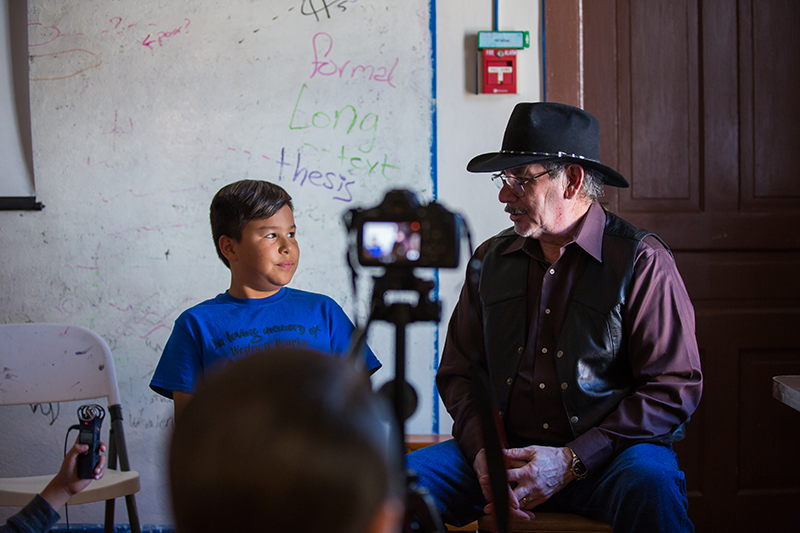 Don participates in "Our Community Story", a student-lead film project. When Donald Montileaux recounts his earliest memory of being an artist, he describes evenings spent drawing with his father after supper. After moving from Kyle, SD on the Pine Ridge Reservation to Rapid City, SD in the 1950’s, Donald attended a small parochial school that did not offer much in the way of arts education. Once he reached high school, however, Donald took every art class that was available. 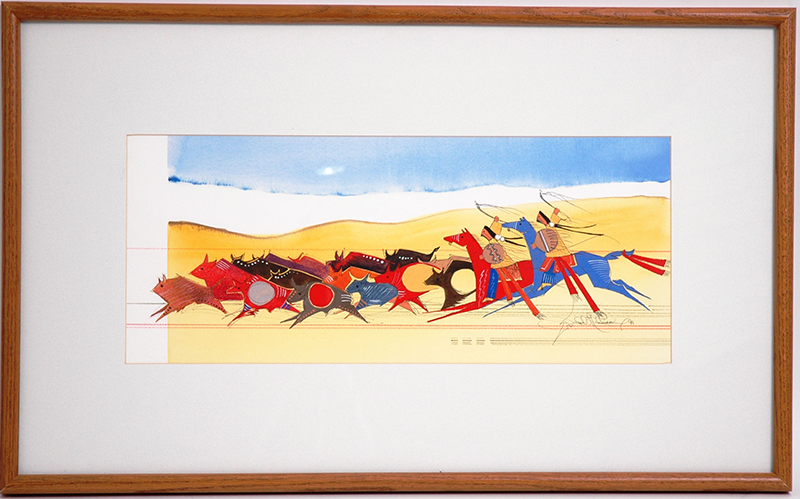 During that period, he also earned a sponsorship from the Sioux Indian Museum in Rapid City to attend a summer workshop program with Oscar Howe, an internationally admired Native artist and teacher at the University of South Dakota. Donald was so impacted by his interactions with Oscar Howe that they developed an ongoing mentoring relationship. After high school, Donald’s growing passion for the arts was emboldened when he was recruited to attend the Institute of American Indian Arts (IAIA) in Santa Fe, NM, a hotbed for the development of contemporary Native artists. Donald’s experience at IAIA opened his eyes to the diversity of Native art, and the different perspectives each tribal culture had to offer. Fast Food, 1994, watercolor, pencil - Courtesy The Heritage Center's permanent collection. Not long after his time at IAIA, Donald sought out a mentoring relationship with fellow Native artist Herman Red Elk, which helped him hone his own artistic style. The elegant, long-legged horses that are a signature of Donald’s work are actually inspired by a story Herman shared with Donald many years ago. Not wanting to compete with Herman, who was a renowned buffalo hide painter, Donald gravitated towards using ledger paper for his art. Native art on ledger paper is a tradition derived from a period in the 19th-century when the buffalo population in the plains plummeted due to the encroachment of European settlers and government-paid hunters who slaughtered the buffalo as trophies. With a lack of hides available as canvas for tribal artwork, Native Americans would barter with traders and soldiers for pages of used ledger books in exchange for other goods. At that time, the Lakota still did not have a written language, and so the artwork created on these pages served as a way to preserve history. 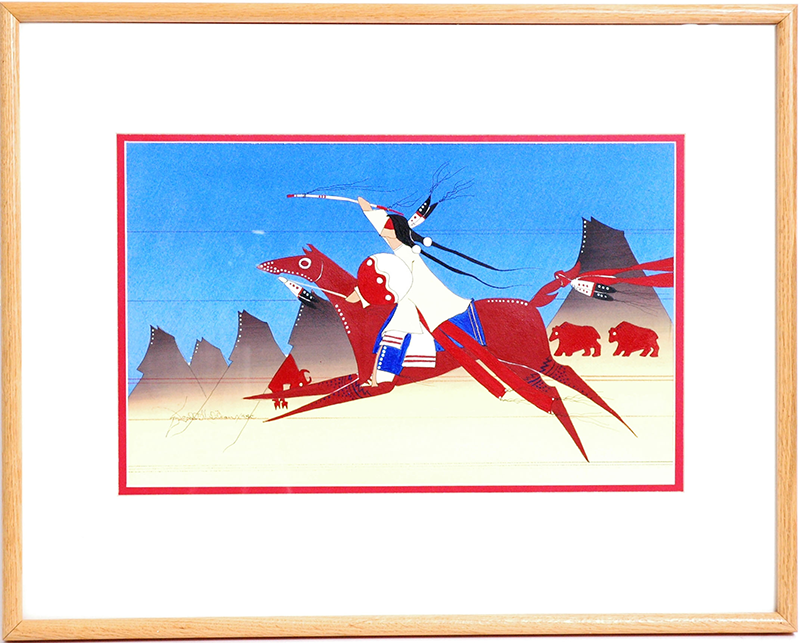 The ledger art that Donald creates today serves not only as a means of preserving images of traditional Lakota life, but also of educating art lovers and art collectors about the Northern Plains tribal culture. He credits art shows as an important means of spreading awareness about the unique styles of art produced in the Northern Plains, as well as a way for artists to gain access to both financial support and feedback. Two Bears, 1996, watercolor, pencil - Courtesy The Heritage Center's permanent collection. The Red Cloud Indian Art Show, which marks its 50th anniversary this year, was the very first show Donald entered as a young artist. And since its start in 1968, he has been a participant each and every year. Although the show had humble beginnings, over five decades it has garnered a reputation not only among local and regional artists, but also on a national scale. Donald notes that the Red Cloud Indian Art Show is known as a venue where artwork consistently sells, which is a major motivator for artists who are developing their craft and working to catch the eye of collectors. Donald’s relationship with The Heritage Center remains strong 50 years later. And indeed, each story Donald Montileaux tells of his journey as an artist is stitched together by his relationships—with family, friends, mentors, mentees, fellow artists, and institutions like IAIA and The Heritage Center. He draws inspiration in that relational aspect of art—and from the many mentors, fellow artists, and relatives—who have shaped his experience and perspective as a creator. And in all his artwork, he celebrates that interconnection. “I used to dance traditional dance, and when I was [at IAIA] in Santa Fe, a guy wrote a poem about dressing in his costume to dance. He said, ‘When I put on my moccasins, I think of my grandma, because I remember her stitching them with sinew and putting on the rawhide sole. When I look at my leggings, I think of my grandpa and how he sewed those leggings together.In the same way, when I make that first step in the dance, I am no longer who I am now, I am all my relatives, and that’s how we dance, as my relatives,’” he remembered.